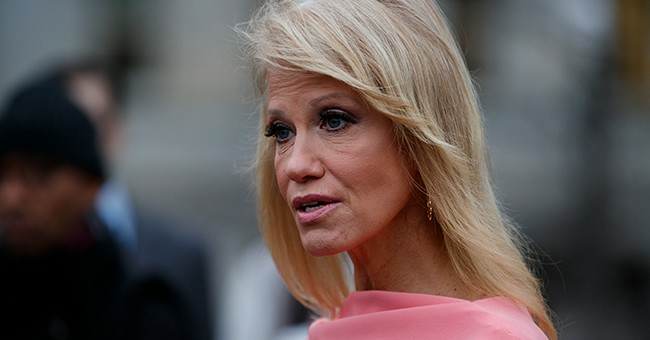 White House counselor Kellyanne Conway described for the first time in an interview with CNN an incident that took place in October when she was allegedly assaulted by an “unhinged” woman at a restaurant in Bethesda, Maryland with her daughter. "Somebody was grabbing me from behind, grabbing my arms, and was shaking me to the point where I felt maybe somebody was hugging me," Conway recalled. “She was just, her whole face was terror and anger. She was right here, and my daughter was right there,” she explained. Conway called 911 but the woman had already left. She was later able to be identified because her daughter recorded part of the incident. “The suspect continued to yell and gesture at her for approximately 8-10 minutes before she was escorted from the restaurant,” states a police report of the incident obtained by CNN. When asked whether she told President Trump, Conway said yes, but “long after” it happened. "[He said] what he always says, 'Are you OK? Are you OK? Is your daughter OK? Are the other girls OK?' " she recalled. The woman, Mary Elizabeth Inabinett, has been charged with second-degree assault and disorderly conduct and will appear in Maryland court in March. Conway explained the reason she never wanted to talk about it publicly was because “other people’s kids were there,” referring to her daughter’s friends. She added: "This woman thinks it's OK to touch someone else? It's not OK."
The woman's attorney, William Alden McDaniel Jr., said his client would plead not guilty and the facts will “show Ms. Conway's account to be false."